贺芳芳, 徐卫忠, 周坤, 等, 2018. 基于雷达资料的上海地区暴雨面雨量计算及应用[J]. 气象, 44(7): 944-951. DOI: 10.7519/j.issn.1000-0526.2018.07.010. HE Fangfang, XU Weizhong, ZHOU Kun, et al, 2018. Compution and Application of Rainstorm Surface Rainfall Based on Radar Data in Shanghai[J]. Meteorological Monthly, 44(7): 944-951. DOI: 10.7519/j.issn.1000-0526.2018.07.010. 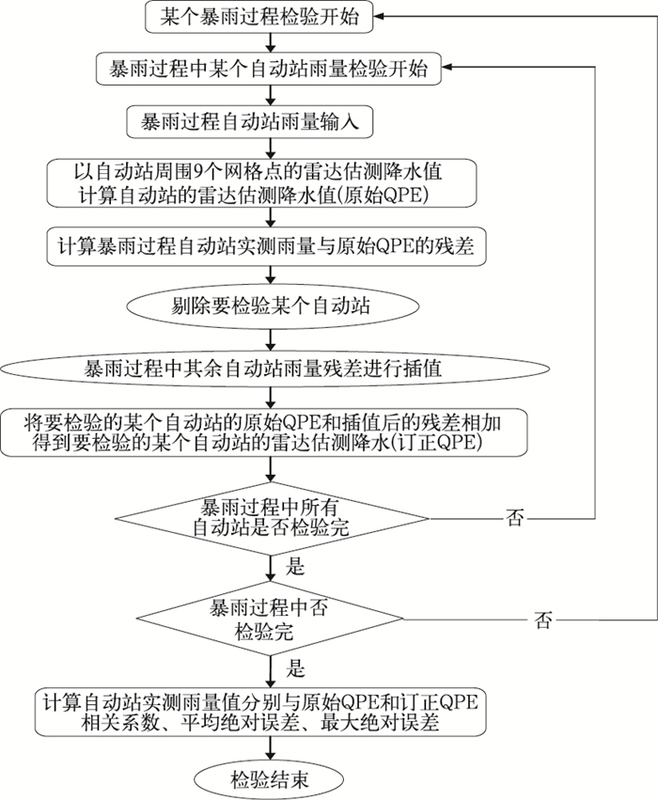 Abstract: The computing method of rainstorm surface rainfall is studied based on the grid product of hourly quantitative precipitation estimation (QPE) of radar data and the automatic weather station (AWS) quality control rainfall data in Shanghai. The computing method is that the radar estimated rainfall of the AWS in rainstorm area, which was obtained from the radar QPE mean of 9 grid points around the AWS, is used to calculate the difference between the rainfall and the radar estimated rainfall of the AWS. The difference field is interpolated into the same grid point of radar precipitation estimation using Kriging interpolation method. The hourly rainfall of grid points is the sum of the residual interpolation data and the radar rainfall estimation of grid points. The average absolute error of QPE and measured rainfall of 24 typical rainstorm cases of all stations is reduced by 27% after correction. The average error of QPE and measured rainfall of main precipitation sections and process rainfall of national weather stations for two typical rainstorms are reduced by 33%-39% and 34%-59% respectively after correction. The value and graph of hourly and process surface rainfall and administrative district as well as water conservancy one-sided rainfall of the 24 typical rainstorms from 2007 to 2015 are calculated and drawn according to the rainfall of grid points using above computing method. Finally, the automated computing inquiry system of rainstorm surface rainfall based on radar data is produced using the development tools of Visual Studio Microsoft 2012 and Microsoft Visual Studio software relying on.NET Framework.4.0 Software development platform. This system will be used for realtime querying and calculation. 傅朝, 杨晓军, 周晓军, 等, 2015. 2013年6月19—20日甘肃陇东南暖区暴雨多普勒雷达特征分析[J]. 气象, 41(9): 1095-1103. 何健, 王春林, 毛夏, 等, 2006. 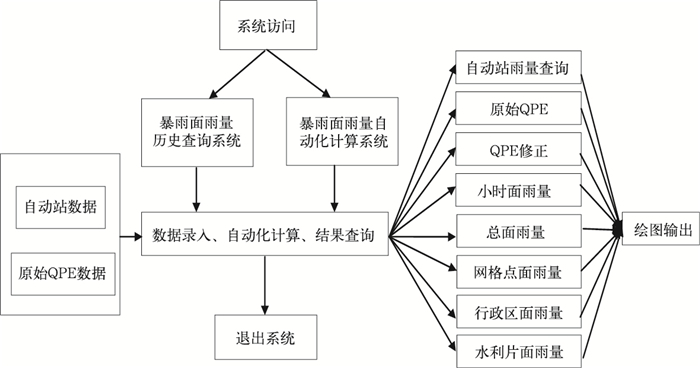 利用雷达回波与GIS技术反演面雨量研究[J]. 气象科技, 34(3): 336-339. 潘永地, 姚益平, 2005. 地面雨量计结合卫星水汽通道资料估算面降水量[J]. 气象, 30(9): 28-30. 徐晶, 林建, 姚学祥, 等, 2001. 七大江河流域面雨量计算方法及应用[J]. 气象, 27(11): 13-16, 51. 徐卫忠, 史军, 徐家良, 2013. 上海短历时设计暴雨强度的时空分布特征[J]. 上海水务, (2): 1-4. 郁淑华, 2001. 面雨量计算方法的比较分析[J]. 四川气象, 21(3): 3-5. 翟家瑞, 1990. 网格点计算面平均雨量的方法及其改进[J]. 人民黄河, (4): 26-28. 张行南, 程晓红, 2005. 网格法在流域面雨量计算中的应用研究[J]. 东北水利水电, 22(5): 16-17, 46. 朱艺青, 王振会, 李南, 等, 2016. 南京雷达数据的一致性分析和订正[J]. 气象学报, 74(2): 298-308.